Leaders from a coalition of free market think tanks urged a swift confirmation of President Donald Trump's proposed labor secretary to resolve uncertainty among U.S. businesses. Trump nominated Andrew Puzder to lead the Department of Labor in December, but his confirmation has been pushed back twice amid delays in filing his disclosure forms and other paperwork issues. The nomination has also inspired intense opposition from union leaders and their allies. 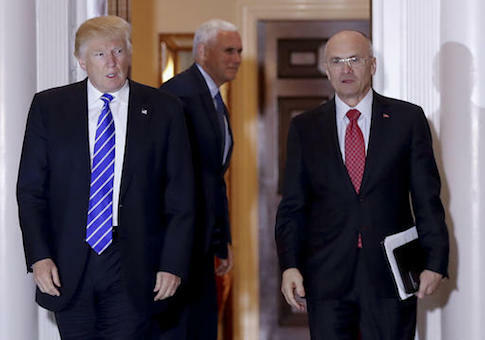 Puzder is CEO of CKE Restaurants, the parent company of fast-food chains Carl's Jr. and Hardees, and if confirmed he would be the first career businessman to lead the department since Ronald Reagan appointed construction executive Ray Donovan in 1981. The coalition of leading policy experts of conservative, libertarian, and free market organizations sent a letter endorsing Puzder to members of the Senate Health, Education, Labor, and Pensions Committee on Monday morning. The groups said that he would bring a fresh perspective to the department after eight years of leadership from former Democratic Congresswoman Hilda Solis and former Maryland labor regulator Tom Perez. "As a longtime successful businessman and employer, Puzder understands what it takes to get Americans working again. We believe a change of labor policy at the federal level is crucial to encourage job creation and spur economic growth," the letter says. "Andrew Puzder would bring a welcome, fresh perspective to the U.S. Labor Department that our country needs." The groups said that the lack of input from the business community had stifled economic growth under the Obama administration. The letter pointed to studies showing that the department was responsible for $57.5 billion in costs to businesses, while generating 70 million hours in additional paperwork to comply with regulations. Those costs had consequences fro American workers and small business owners. "Under the Obama Labor Department, for the first time in 35 years, more American businesses closed than launched," the letter says. "This decline in entrepreneurship and opportunities has made it harder for people to find work and many Americans have simply given up looking for jobs altogether." Supporters hope to see Puzder roll back onerous regulations, such as the new overtime rules the Obama administration adopted in 2016. Those rules would double the threshold at which companies must pay a white collar or administrative employee overtime. An Obama-appointed federal judge blocked the new rules in November after business groups and states sued the administration. The department has appealed that decision. The groups hope that Puzder's confirmation could balance the ledger and refocus the department to take a less adversarial approach to the American workplace. "American workers need a Labor Secretary with real-world experience creating jobs and opportunities, and we believe Andrew Puzder will fulfill that role," it says. "By making sure the Labor Department promotes deregulatory policies, Andrew Puzder can foster and encourage the business formation that makes job creation possible. Those are goals that our organizations support and all Americans can get behind." The letter was signed by the leaders of the Competitive Enterprise Institute, Americans for Tax Reform, Capital Research Center, Center for Individual Freedom, Conservative Reform Network, Freedom Foundation, FreedomWorks, Grassroot Hawaii Action, Inc., Illinois Policy Institute, Institute for Liberty, The James Madison Institute, Jeffersonian Project, National Center for Policy Analysis, Rio Grande Foundation, Taxpayers Protection Alliance, Washington Policy Center, and Wyoming Liberty Group. Puzder's confirmation hearing before the Senate HELP Committee is scheduled for Feb. 7. This entry was posted in Issues and tagged Department of Labor, Trump Administration. Bookmark the permalink.